Egg (Nit): Nits are head lice eggs. They are very small, about the size of a knot in thread, hard to see, and are often confused for dandruff or hair spray droplets. 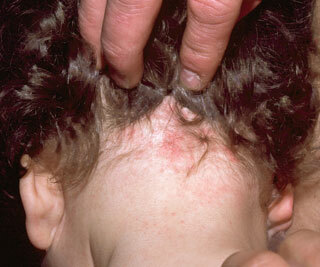 Nits are laid by the adult female at the base of the hair shaft nearest the scalp. They are firmly attached to the hair shaft. They are oval and usually yellow to white. Nits take about 1 week to hatch. 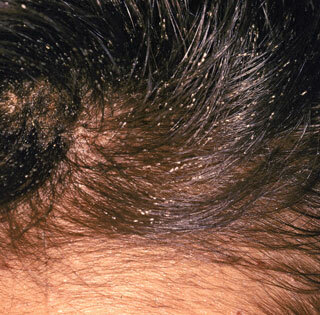 Eggs that are likely to hatch are usually located within 1/4 inch of the scalp. Nymph: The nit hatches into a baby louse called a nymph. 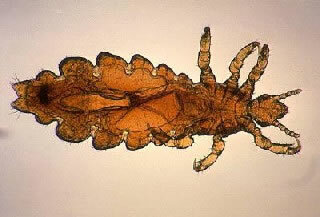 It looks like an adult head louse, but is smaller. Nymphs mature into adults about 7 days after hatching. To live, the nymph must feed on blood. Adult: The adult louse is about the size of a sesame seed, has six legs, and is tan to greyish-white. In persons with dark hair, the adult louse will look darker. Females, which are usually larger than the males, lay eggs. 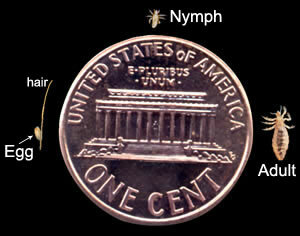 Adult lice can live up to 30 days on a person's head. To live, adult lice need to feed on blood. If the louse falls off a person, it dies within 2 days.